While never actually uttered, this line is a tame, paraphrased version of some heckling that was going on near Wabash’s own end zone after Tyler Burke, Wabash’s back-up quarterback, took another bone jarring, high-low hit at the hands of two North Central College defenders. The hit helicoptered Burke’s body before gravity pulled it inevitably back down to the turf, as the spectator chest pounding occurred on the other side of the ropes just paces from Burke. Wabash trailed 28-7 at the time and the scene was eerily similar to the final sequence from the movie “The Karate Kid” from which the lead line was taken. Though sanitized, the line reflected the sentiment of a vocal minority of NCC student supporters who smelled blood in the proverbial waters, perhaps sensing another 50+ point scoring barrage reminiscent of five other games during their season. Actually, this would be a relatively pedestrian expectation for a team that scored 51, 59, 61, 70 and 86 points in the aforementioned games, which resulted in an average margin of victory of 50 points in those games. What made the scene even more irritating and antagonizing was the fact that this heckling was coming from some Cardinal cads clad in red-and-white stripped overalls, which, if you hadn’t have known better, could have been stolen right off the backs of our own Sphinx Clubbers. As conspiracy theories circled in my mind, the Little Giants circled the wagons and began what my own eyes would recall as the most improbable comeback in football history. I didn’t say Wabash football history, or Division III history, NCAA history, or even NFL history. Rather, football history. Sure, when you Google “The Comeback,” you get Wiki references to the Buffalo Bills 32-point comeback against the Houston Oilers in their 1993 playoff tilt. Interestingly, Wabash’s own Pete Metzelaars played in that game, and a back-up quarterback, Frank Reich, engineered the drives that brought delirium to Rich Stadium. As Burke peeled himself off of the new turf at Hollett Little Giant Stadium, it looked as if he would be lucky to make it to the sidelines one more time, let alone help his team score 22 unanswered points in the fourth quarter against a team that registered three shutouts during the season and yielded an average of only 11 points a game. Here’s why this comeback was better than the Bills or any other comeback for that matter. In the NFL, philosophies and policies help govern parity among teams that is paramount to all activity. Drafts, schedules, and salary caps all endeavor to ensure that all teams have an equal shot at winning. In Division III football these days, parity is a pipedream. The same two teams have played for the football championship in each of the last six years. These same two teams have won nine of the last ten championships. One of these teams, Mount Union, has won 10 titles in the last 17 years. Rosters of these teams are replete with Division I athletes, many of whom earned football scholarships, who have come back home to Division III schools who do not give athletic scholarships. Now, North Central is not one of these two teams. But they too are now stacking Division I players like pancakes at an all you can eat charity breakfast. NCC had nearly 20 such players, so many, in fact, that the online roster needs a separate column for “Previous School.” While Wabash’s spreadsheet for this information contains such information as Carroll, Park Tudor, and East Noble High Schools, NCC’s has schools listed like Northern Illinois (playing for the MidAmerican Conference championship), Illinois State, and OREGON, a team that played for the Division I national championship last year and is currently ranked in the top ten in the BCS standings. So, before the game started, many figured it was over. Including me. I had even wondered whether to come to this game because the previous weekend had been so dangerously close to perfect. 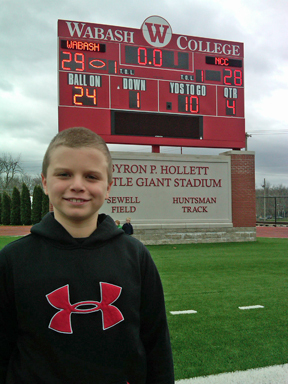 Wabash rolled over Illinois College on a crisp but comfortable fall day under blue skies, and my dad, father-in-law (who played defensive line at Virginia Tech), and 10 year-old son were all impressed by everything from our excellent rushing attack to the Sphinx Club push-ups. Post game pizza and storytelling at the Phi Delt house topped the day off better than whipped cream on pumpkin pie. Why cloud that memory with a potential drubbing from a school that has a 6-foot 7-inch 266-pound tight end and a team that averaged 7 yards per rush behind a line that averaged 280 pounds? In a phrase, “Wabash Always Fights,” that’s why. As I drove to the game with my son, I hoped it would at least be respectable. We made a visit to the bookstore before the game, thinking I could soften the impending hits with gifts, and bought my son a red Wabash shirt (he already has a black one) but for some reason, I gathered some other items as well. I bought a wall hanging that included the chorus to the fight song (“The longest in fight song in the nation” I explained to my son hoping to score some points before the game where we not be able to do the same). I also bought a large car magnet scoreboard where you can fill in the Wabash opponent and score. I reasoned that regardless of this game’s outcome I would put the last two Monon Bell scores on there: Wabash 92 DePauw 7. I was feeling better already. And, oh yeah, I purchased another one of those large car magnets that read “Wabash Always Fights.” “That’s what we do…never give up,” I told my son, with a little bit of a sigh. As the game started, Tyler Burke actually became the perfect excuse for me. I did not realize Chase Belton, our starting QB, was injured and would not play, so now I could at least blame the loss on the fact that we had our second string quarterback in the lineup. When two of his first three passes were intercepted, including a quacker more at home on the opening day of duck season, I was hoping d3football.com would bury our game summary well below the Mt. Union and UW-Whitewater white-washings. After giving up 128 yards rushing in the first half and being on the wrong end of a 21-0 score, I felt myself again hoping for respectability. Then, like the Energizer Bunny with a fresh set, our 6-foot, 172-pound (must have been in his pads) back-up quarterback gave the striped goons on the NCC sideline, and everyone else in attendance, including me, a public lesson in our unofficial mission statement. Sure, our TALL mission statement that mentions thinking critically, acting responsibly, leading effectively and living humanely may be on all of materials, but “Wabash Always Fights” has been our battle cry for decades. After just 79 yards of total offense in the first half, Burke accounted for over 350 himself in the second half. Despite being hit on all 49 passes he threw during the day, including two that drew personal foul penalties, Burke got back to his feet each time, though most of the time it was with the help of teammates. An early third-quarter 24-yard dash for his life gave all in attendance a glimmer of hope that Peter Bulandr, NCCs Division III player of the year candidate, a 6-foot four-inch, 280-pound defensive tackle, might run out of gas chasing him. Consider four more reasons this comeback was the greatest ever: Wabash converted on four fourth down plays in the second half alone. And these weren’t your fourth and a foot, push the QB forward-type of fourth down plays. Each was over four yards, three were eight yards or more, including a fourth-and-12 and a fourth-and-15. On one of those plays the receiver fell down during the route when the ball was in the air, got up and made the catch, and on another, Burke was again running for his life again from a set of all conference linebackers. By now you’ve read accounts of the game online and perhaps have seen video highlights, but the reason this game will be remembered is because of the two-point conversion after we scored to get to within one point at 28-27. Many of us in the stands were clamoring for a kick, taking our chances in overtime. But you really needed only a tid bit of research to know we were going to go for two. That’s not a typo. We do indeed have bigger bells. You need to look no further than the respective schools’ rivalry games for justification for of the assertion above. Our rivalry game’s prize is, of course, the Monon Bell, a gargantuan bell with a giant clapper, which weighs in at 350 pounds. North Central on the other hand, plays its rivalry game, against Wheaton since 1946, for the “Little Brass Bell.” While our Bell needs to be carried by four football linemen, their bell looks as if it could fit in one hand. Again, we’ve got bigger bells. (Note: We’ve won 37 Bell games, 56 total vs. DePauw but the Bell was introduced as the prize in 1932, and North Central has won 19 Little Brass Bells. Assuming their bell weighs five pounds, they have less than 100 pounds of bells, while we’ve got a total of six and a half tons of bells. That’s why Raeburn went for it. Bigger bells. More bells. And it was echoes from a previous Bell game that reverberated as the conversion was attempted. Not only was Jake Knott, the quarterback who made “The Catch” possible giving Wabash a 27-21 victory in the 2002 Bell game, in attendance for this playoff game, but the ball was caught by Brady Young, who not only wore the same number as Kurt Casper, the gent who caught “The Catch,” #83, but also snared the tipped ball in precisely the same spot in the end zone. Yet another reason why this was the greatest comeback ever — historic precedence and intrigue. Heck, the Houston Oilers don’t even exist anymore. As Wabash made the defensive plays to stop North Central in the final minute including the game-sealing interception, the final reasons that this was the greatest comeback in football history were about to unfold. My son and I joined the celebration on the field where a team of crying young men, alums, administrators, parents, and girlfriends sang the entire first verse of the fight song. “Longest in the nation,” I whispered at one point to my son as he attempted to join in the chorus as I thought about my bookstore purchases. 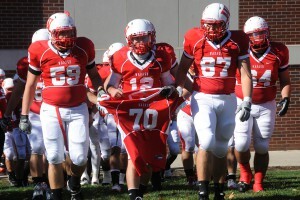 We then took the time to walk around the field and thank Wabash players for their fight. I introduced Gehrig to CJ Gum, Tyler Burke, Wes Chamblee. A couple of them actually said, “You’re welcome, sir.” I had mixed emotions about being perceived old enough to be called sir, but was thankful for their gentlemanly manner post battle. Now, the North Central players had finished their post-game debrief and were making their way across the field to their bus. I saw this as another opportunity for some valuable life lessons for my son. I began shaking hands with North Central players, thanking them for their efforts and congratulating them on a great season. Then, #89, their six-foot, seven-inch, 266-pound tight end walked by and I reached up to say what a great team I thought they had. “Your team has a lot of heart to come back like that,” he said. “Wabash Always Fights,” said my son. Asst. 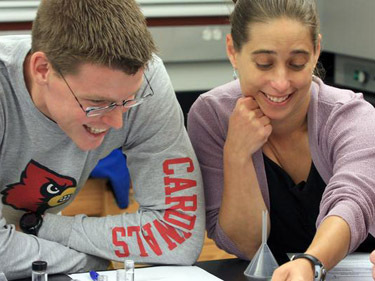 Professor of Biology Tami Ransom is in her first semester at Wabash. Howard W. Hewitt – A lot of time and oxygen is spent around Wabash College trying to explain to high school seniors, and others, the magic that happens in our classrooms. Sure, our young visitors are told about the important professor-student interaction and how fellow students will challenge and support each other in intellectual discourse. But citing the oldest cliche – a picture is worth a thousand words. Each fall members of the Public Affairs staff take one or two weeks to get into classrooms and try to record some of that magic for all to see. It’s always an interesting challenge to walk into the room with a shoulder bag full of photo equipment and ask not to be noticed. Our challenge is to try to capture those moments when professor and student connect. We look for that moment the light bulb goes off when learning a new concept, idea, or the experiment works. We’re not going to find that moment each time we enter a classroom for 30-45 minutes. But it’s a fun challenge trying to capture some magic and witnessing a Wabash College education in progress. Here are some of the photos we’ve shot to date. We’ll be adding more! Jim Amidon — Just when you think you’ve seen it all, along comes the 118th Monon Bell Classic. Fans who’ve watched the annual battle between Wabash College and DePauw University over the last quarter century have seen epic struggles, big plays, record-breaking offenses, and last-second heroics. But no one could have predicted what happened Saturday in Greencastle, when the Little Giants rode an unrelenting defense to a 45-7 win and a perfect 10-0 regular season record. After a sluggish first 10 minutes, Wabash blitzed the hosts with 21 points in just over two minutes. A fumble recovery led to Vann Hunt’s 33-yard touchdown run, which was followed by Jonathon Koop’s interception return for a touchdown and a Wes Chamblee punt return touchdown. While Wabash’s offense sputtered and fizzled for much of the game, the team’s defense swarmed, pounded, ran like the wind, and aggressively punished a DePauw offense that had been decimated by injuries all year long. It was one of the most awe-inspiring defensive efforts in Monon memory. And while maybe it shouldn’t have been surprising given the personality of the team’s defensive leader, C.J. Gum , it was a stunning game plan executed to near perfection. By game’s end, he had made 16 tackles and a sack. But his pile-driving hits set the tone for the day and clearly rattled the Tiger offense. Freshman linebackers Cody Buresh and A.J. Akinribade fed off Gum’s energy and focus. It’s rare when freshmen perform well in their first Bell game, but those two guys played like senior veterans. Akinribade, who was recruited by DePauw, had five tackles and a sack; the sack resulted in a fumble and a Wabash touchdown. 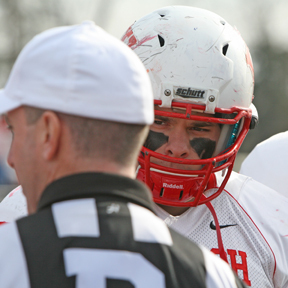 Buresh had six tackles and helped Wabash limit DePauw to just 39 rushing yards. Another freshman performed every bit as well. Denzel Wilkins, a safety, had five tackles and returned an interception for a touchdown. Just before halftime, the defense took what little life DePauw had and snuffed it out. Akinribade hammered Tiger quarterback Will King, who fumbled the ball into his own endzone and Pat Clegg pounced on the ball for a 31-0 lead at the break. It was Clegg who had hit King earlier in the game, which led to Koop’s interception. It was a literal feeding frenzy for Wabash’s defense; each player on the field seemed to want to get his name in the box score. The defensive intensity helped offset Wabash’s sluggish offense. The key going in, according to Coach Erik Raeburn, was to avoid offensive turnovers. While Chase Belton completed only two passes (and All-Conference receiver Jonathan Horn never caught a pass), the offense held on to the ball and scored when it needed to. DePauw’s defense played a valiant game, but the Tigers’ offense was no match for Wabash. Wes Chamblee scored on a 44-yard punt return. I’ve seen a lot of Monon Bell Games, but I’ve never seen one quite like the 118th clash. The defense scored three times and set up two other touchdowns with turnovers. The win, the defensive performance, the undefeated regular season — all had to be satisfying for Gum, who returned for a fifth year with a medical redshirt. Chamblee, his fellow co-captain, was all smiles after the game. Wes blew out his knee in the season-opener last year, but worked so hard in rehabilitation, he returned for his final year better than ever. Chamblee got his Monon Moment, too. Late in the first quarter, DePauw punted high into the wind. Chamblee spied the ball and with a running start caught the punt. Five seconds later he was in the endzone celebrating his fourth return touchdown of the year. And as he has done all season, he pointed to Heaven in a salute to his grandfather. The Monon Bell rivalry is special because both DePauw and Wabash are excellent institutions and alumni from both schools are proud and generous. But when the day is done and the bell is ringing on the winning sideline, the thing that matters most is the intensity of the athletes who put it all on the line for 60 minutes with the world watching. On Saturday, it was Wabash that delivered the intensity and focus, and the Little Giants will ring the Monon Bell for another year. John Dykstra ‘13 – Wabash men have been encouraged to promote awareness of men’s cancers by not shaving their facial hair this Movember. Movember is a global health campaign in which men sport facial hair and raise money to fund research on prostate cancer. The Movember Foundation’s goals are to support survivorship, increase awareness and education for male health risks, and influence a positive change in men’s health. Director of Public Affairs Jim Amidon is a survivor of bladder cancer. He was first diagnosed at age 34. He said he has never gone three days without shaving and has used his unkempt facial hair to educate people about bladder cancer. Amidon shared his experience with cancer and provided health suggestions to the Wabash community through an email sent by Sphinx Club President Tyler Wade. He advocated increasing education on cancer and having regular check-ups. The Movember Foundation has funded mustache competitions throughout the world. At the beginning of the month, Hampden-Sydney College of Virginia and Morehouse College of Georgia, both all-male campuses, challenged Wabash to a mustache competition. The winner of the competition will receive a travelling trophy. Tyler Wade announced the competition to the student body on October 31. “Success in this competition will accomplish several goals—the most significant one being raising awareness of and funds for fighting cancers that affect men; another being winning a traveling trophy sponsored by the Deans of Students of each institution; and also furthering campus camaraderie and unity,” Wade said. “We Wabash Men thrive on the challenges of stiff competition—whether it is from our sister institutions or cancer and I am sure you will rise to the challenge! Wabash’s Bell Week tradition the Monon Mustache competition suits the Movember campaign. Wednesday night, men flaunted their mustaches in front of Dr. Blix and other judges. Josh Manker ’14 started growing a beard during the soccer team’s preseason. After Wabash’s loss against DePauw, he shaved it into a mustache. 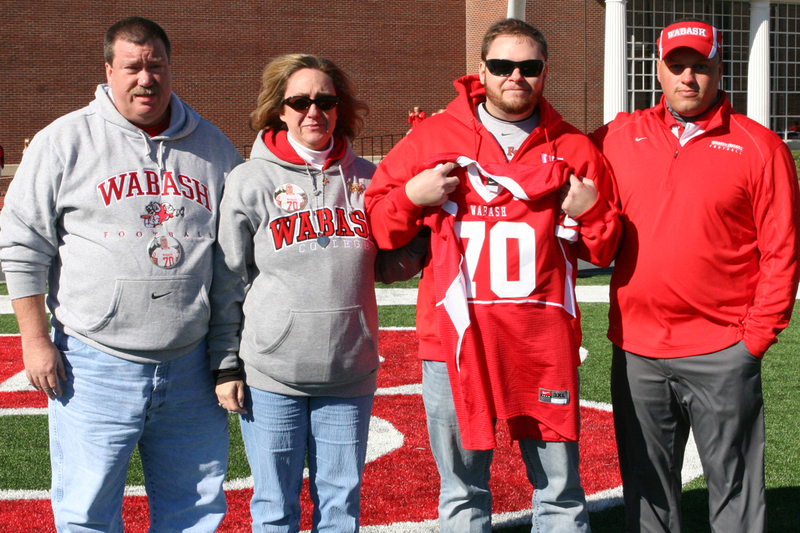 He has enjoyed the support from the Wabash community. Sphinx Club member Daniel Lesch corresponded Wednesday evening’s event. He emphasized how the Monon Mustache symbolizes virility and related the competition to Movember. Last year, the Movember Foundation raised 80.7 million dollars globally—7.5 million was raised in the United States—through 447,831 Mo Bros and Sistas. The Foundation’s website explained that Mo Bros are men who participate by growing mustaches and raising money; Mo Sistas are wives who support their husbands and also raise money. The Foundation considers mustaches a “walking, talking billboard” that makes people more aware of men’s health and cancers that affect males. Wabash Men have an opportunity to contribute to fighting male health concerns by participating in Movember. The travelling trophy is an added bonus and campus unity is apparent every year through the Monon Mustache competition. Men, continue flaunting your mustaches beyond the Bell Game for the sake of promoting men’s health. Mike, Debbie, and Chad LInthicum. Jim Amidon — For about 15 years, I’ve taken senior photos at Wabash College sporting events. The drill is almost always the same: Line up the seniors and their parents before the start of the last home game/meet/match and snap a photo of the senior, the coach, and the family. I say “drill” because for my part, it’s pretty consistent from sport to sport and season to season. But I do consider it an honor to take those photographs. The parents are usually beaming with pride (moms will occasionally shed a tear) and the student-athletes exude confidence and accomplishment. At the moment I snap the shot, I think about that particular senior and the mark he’s left at Wabash — in the sport and across campus. Most of the College’s athletes have back stories — maybe they’re actors or mathematicians; moot court competitors or economics tutors. When I take the photo, I think about the whole man and the opportunities he’s seized during his four years at Wabash. The seniors carry Josh Linthicum's jersey and memory into the conference championship game. Saturday, 20 minutes before kickoff of Wabash’s North Coast Athletic Conference championship game against Wittenberg, I was on the field as the senior football players gathered under the west goal posts. Coach Erik Raeburn stood on the goal line as each senior was introduced with his parents. I chatted with Wes Chamblee, the All-American kick return specialist and national qualifying hurdler. I told him I was proud of him. He responded by saying, “We’ve got a lot more to do before you can be proud of us.” And then he told me he’d catch up with me in a couple of weeks. For the second time, he’s editor of the X-Position, the magazine of the Malcolm X Institute of Black Studies. It was heartening that moments before one of the biggest games in his career, Wes had no interest in celebrating his past accomplishments. He was looking forward — and even thinking about his duties as editor of that magazine. C.J. Gum, Wabash’s fiercest fifth-year senior ever, had a look of focused determination as he gathered with his family before the player introductions. Eyes forward and emotionless when I took the photo, Gum walked across the field with his parents holding each of those mammoth arms. As usual, he let his play do the talking — crushing tackles, forcing a huge interception early in the game, and covering a late onside kick. If ever there was a lead-pipe lock for a repeat conference defensive player of the year, Gum is that player. The hulking senior offensive linemen — Jack Ruddy, Jake Shaffer, Bryan Elliott, Quintin Burkett, and Chris Daniel — have gotten little recognition during their playing careers. They just show up and do their jobs. On Saturday, each man had a face and a name, and earned the accolades they richly deserved. And by game’s end, they enjoyed the ultimate tribute — their blocking paved the way for a punishing rushing attack that tamed the Tigers. The most gripping moment came last. After the final senior football player had been introduced, the stadium grew completely silent. A proud father, forcing back tears, propped up his sobbing wife as Josh Linthicum’s name rang out over the public address speakers. Josh was one of those hulking offensive linemen; bigger than all of them, in fact. It was to have been his senior day. 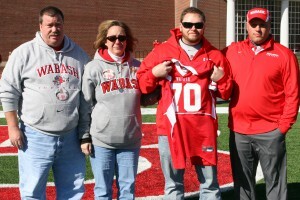 It was to have been a day when a proud family could stride across the field to celebrate his Wabash career. Josh died from complications during what was thought to be routine surgery over the holidays a couple of years ago. 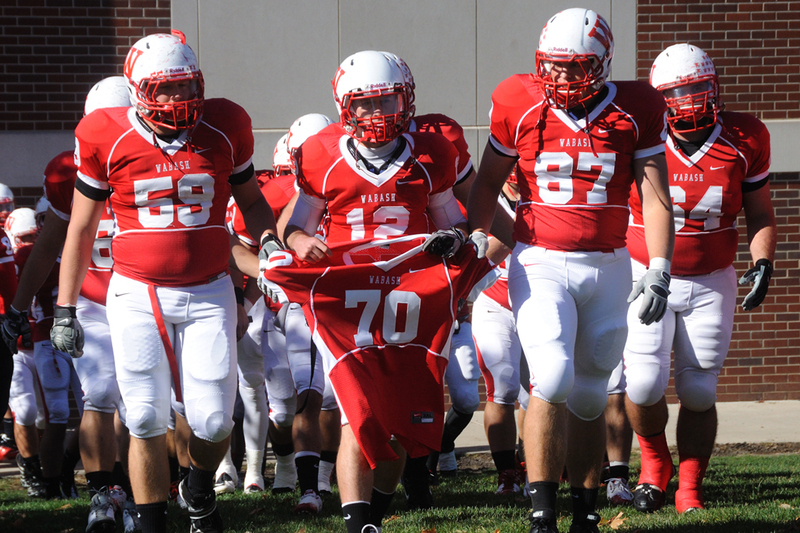 His passing was a crushing blow to Wabash, to the football team, and to scores of parents who think little of those “routine” off-season surgeries so many athletes undergo. For Mike and Debbie Linthicum, it was the ultimate loss, and no parent can ever imagine a tragedy that strikes so quickly and painfully. I’m told that his parents have gained strength by knowing the impact Josh had at Wabash, the friendships he made here, and the easiness of his personality that made him an instant buddy with every person he met. I can’t imagine they would have returned to Wabash for senior day had they not felt a profound connection to the College and Josh’s senior teammates. I don’t know that Coach Raeburn had to give any kind of “Win this one for Josh” speech. I do know that Josh’s presence was felt by every senior in every game they played following his death. Each man who stepped on the field Saturday did so with the number 70 on the back of their helmets and with a little piece of Josh in their hearts. Yes, the win brought another conference championship to Wabash. More important, it provided a meaningful tribute to the seniors’ fallen brother.